The crazy guy / woodworker has been at it again. I built this just because it challenged me. 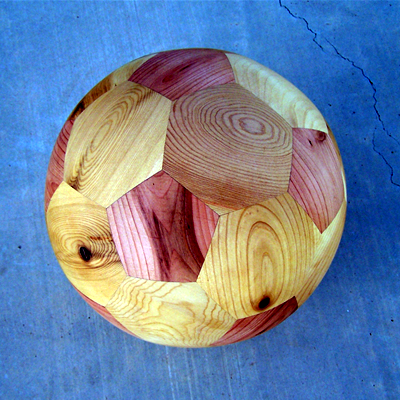 One day I saw a soccer ball in the trunk of my son’s car and just knew I had to try making one out of wood. First I had to do some research, then brush up on some long unused math skills, finally cut parts and glue them up. Bucky balls are named after Buckminster Fuller, the man who popularized the geodesic dome. 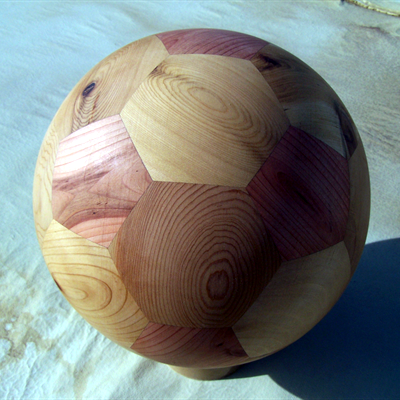 The shape, often referred to as a Buckminster Fullerine, is found in the Carbon 60 molecule, the truncated icosahedron and many soccer balls. 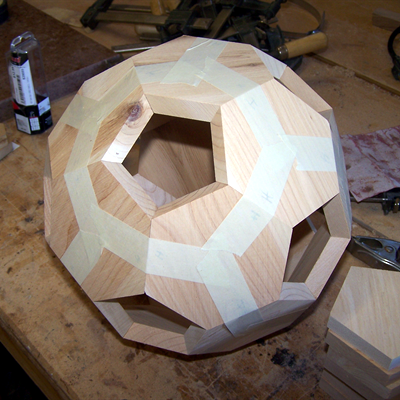 This one planned as a prototype is made from cypress, the hexagons, and western red cedar, the pentagons. I think it is pretty neat in a “nerdy” sort of way. It was definitely a challenge to layout, cut, assemble, turn, sand and even finish. Will I make another? Yes, because I truly do belong in a straight-jacket. (Don’t give those white coat guys my address.) The next one will actually be a lidded bowl. For anyone interested, both the hexagons and the pentagons are regular. The degree of precision required in sizing the pieces and in cutting the compound angles is well beyond anything I have ever done before.